All right. Let’s get started today. This is an AIA registered course. Another clause that we’ll look at is owner’s responsibilities. In a design firm contract with a project owner, you have a list of things that the design firm is responsible for, but it’s also important to clarify responsibilities that the owner will have. And so, the contract between the design professional and the owner should at least set forth some of the key responsibilities of the project owner. The B101 article five includes a 12 paragraph description of some of those duties of the owner, and I’m not going to go through all of these, but I will just put down a slide just very quickly and let you just take a look at it, and I recommend you just go read that contract clause to get a better feel for that. You’ll see some of the items, they’re going to be provide information regarding requirements of the project. They’re going to periodically update the budget. They’re going to render decisions and approve the architect’s submittals in a timely matter. So it goes through with a lot of these key requirements for the owner. The EJCDC document E-500, likewise it addresses owner responsibilities in Article B2.01. Again, I’m not going to go through this in great detail, but I would like to put up the clause so you can just take a quick look at one part of that clause. You’ll see here that the owner is required to provide the engineer with all the criteria and full information as to the owner’s requirements for the project, including the design objectives and constraints, space capacity, performance requirements, flexibility, expandability, and any budgetary limitations. And then it goes on from there. Another issue that we deal with is substitution request by contractors, where the owner decides to accept that substitution or equal or product substitution that is proposed by a contractor, and the design firm says, “No. This is not a good idea. This is not appropriate for the design of this project. There are more risks inherent in making this substitution, and we advise the owner against it.” But yet, you have owners that want to do it anyway because the contractor is saying “we’ll save money doing this and we’ll share the savings with you, the owner, so you should do this.” The AIA has come up with good language to address this, and it is at Article 3.14. And it says the following, “The architect shall not be responsible for an owner’s directive or substitution made without the architect’s approval.” Close quote. What that effectively does is if the owner decides to take a substitution and the architect has not approved of that substitution, than the owner assumes all that risk and can’t come back to the architect and say, “Hey. You should have told us not to do it. You should have given us a more detailed explanation for why we should reject that equipment.” And there are a lot of cases like that, where project owners literally would be advised by their design firm, don’t accept this equipment. Then the owner accepts it anyway. Years later, there’s a problem. They come back to the design firm. They say “the HVAC system isn’t cooling the building well enough. We have this problem or that problem,” and the architect or designer engineer says, “But we told you not to accept the equipment.” And the owner says, “But you should have understood that we needed a better detailed explanation. We’re just dumb owners. We don’t know.” And of course they’ve gone along with that. So this language, I think, effectively takes care of that problem so that it says that the architect has no responsibility if that decision for a substitution is made without the architect’s approval. Copyright and ownership of documents. This is a really important issue today, particularly I think for architects and even somewhat so for engineers as well. Contracts such as the AIA, B101, and the EJCDC, E-500, state that the instruments of service belong to the design professional that created them. Owners today seem to be more typically requiring that these instruments of service be tendered to the project owner, not only as their property for use on this project, but actually transferring full copyright ownership to them as well, entitling them to reuse those documents at will for any purpose whatsoever, and not necessarily limited to the project. Not necessarily limited to this time frame. You can imagine a situation where a project owner that builds cookie cutter restaurants or warehouses gets a design from a design firm with a full transfer of copyright ownership, and then is entitled to go out and replicate that design 100 times again, all over the world. That’s going to create more risk because when it was originally designed, it was designed for a particular locale, for a type of soil, for a type of climate, a type of wind, a type of weather, snow. All these factors get considered in when a design is created for a building. And for an owner to take that design and then use it anywhere, means that the designer is at risk for things that it could not have anticipated. So the answer to this first is to try to resist the project owner that wants that copyright, to say that no, it’s our copyright. You have a license to use it on this project. But if you can’t do that, then the fall back is to create an indemnity section in the contract. And so, the indemnity type language would state something to the effect that if the owner does reuse those documents without the participation of the design firm, then the owner will indemnify the design firm from any liability and will release the design firm from any and all damages arising out of the reuse. And that’s the type of language that we typically use. The AIA B101 has language like that, and I’m going to put that up on the screen here and you can read through that with me. It says quote, “In the event the owner uses the instruments of service without retaining the author of the instruments of service, the owner releases the architect and the architect’s consultants from all claims and causes of action arising from such uses. The owner to the extent permitted by law further agrees to indemnify and hold harmless the architect and its consultants from all costs and expenses including the cost of defense, related to claims and causes of action asserted by any third person or entity to the extent such costs and expenses arise from the owner’s use of the instruments of service under this section.” Close quote. One of the problems when you transfer copyright to a project owner is what is the extent of the copyright being transferred. Are you transferring even things that pre-existed? Are you giving away your own design details that you’ve used historically in your firm? Because they’re all intermingled with the design you create for the project owner. I think it’s very clear to distinguish and say that you’re only giving the owner what you’ve created new for this project, and that you are reserving your ownership of everything that pre-dated that, including your own design library, your own detail library. The consensus docs 240 deals with it in an interesting way. Their clause at 10.1.4 reads as follows. Quote, “Where the architect engineer has transferred his copyright interest in the documents under subparagraph 10.1.1, the architect engineer may reuse documents prepared pursuant to this agreement in its practice, but only in their separate constituent parts and not as whole.” Close quote. So what that effectively does is it allows the design firm to reuse all the design. You can’t create let’s say a new building design and then go out and replicate that exact design for another firm somewhere else in a different city. But you can take constituent parts of that building, as long as you’re not putting them all together in some recognizable way that the whole of the building is somewhat duplicated. I mentioned the issue with giving away your library of your own design details when you give away the copyrights and to be careful about that. 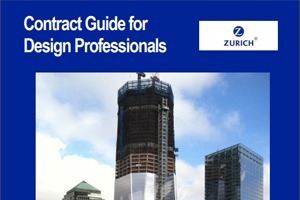 Here is a clause that protects the design firm against that potential issue. So let’s read this one together. Quote, “Client expressly acknowledges and agrees that the documents and data to be provided by the consultant under this agreement may contain certain design details, features, and concepts from the consultant’s own practice detail library, which collectively may form portions of the design for the project, but which separately are and shall remain in the sole and exclusive property of consultant. Nothing herein shall be construed as a limitation on consultant’s right to reuse such component design details, features, and concepts on other projects, in other context or for other clients.” Close quote. So, you can see how that preserves and protects the design detail library that pre-existed this project, and allows the designer to continue using its own proprietary information and know how on other projects. Let’s talk about payment issues, payment problems. Beware of the withholding of fees provision in some contracts by project owners. If the project owner is allowed to hold fee for any reason within its sole discretion, because it feels that the services were not adequately performed, properly performed, whatever, it effectively allows the owner to become the judge and jury. And instead of requiring the owner to basically file a suit against the design firm to recover damages, the owner is holding all that money. And we all know that if an owner holds money and a design firm files a suit, a claim against the project owner, its client for fee, inevitably what are we going to get? A counter claim. And unfortunately, those counter claims get a life of their own and it’s a sad business. So the answer is, don’t set yourself up as a design firm to allow that, but rather manage it. So the AIA B101 has a good provision that effectively allows the owner to withhold fees, but only under certain circumstances. And this would protect the designer or the architect, against just an arbitrary withholding of fees. Let’s read this clause together. Quote, “The owner shall not withhold amounts from the architect’s compensation to impose a penalty or liquidated damage on the architect or to offset sums requested by or paid to the contractors for the cost of changes in the work, unless the architect agrees or has been found liable for the amounts in a binding dispute resolution proceeding.” Close quote. You can see from that clause that it somewhat ties the hands of the project owner, so they can’t withhold the money unless it’s first been determined that there was liability. What do you do if payments are made late? One of the things that we have found, and I’ve even found it in my own invoicing, is the value of putting a late penalty, an interest, a provision that if they don’t pay in time, the client doesn’t pay on time, then interest is assessed. So use a clause like the one I’m going to put up next. Quote, “Payment. Owner agrees to pay the design professional’s invoice within 30 days of receipt. For any payment not received within that time limit, the owner shall pay a service charge on the past due amount, including interest, at the prevailing rate of blank. And reasonable attorney’s fees and expenses if collected through an attorney or collection agency.” Close quote. And the clause goes on from there. But you see from that that the owner can no longer just use a design firm as a bank, and when we’ve been in these tough economic times, there have been some very long late payments made from project owners. And the design firms, on a hope and a prayer, continue working without getting paid, and maybe the project owner eventually catches up and pays them, but unfortunately in a number of instances, the property development could not proceed. The owner had no money from the bank. The architect never got paid. So this way, you are putting pressure on the owner to pay. Other clauses in the contract concerning payment should be that if you are not paid within a certain time, then certainly you can terminate or suspend your services. You shouldn’t have to keep working without pay. Let’s talk now about permits. The design professional can be expected to maintain or obtain permits and licenses that are needed for it to be registered to do its professional service in a state, or that might be needed for it to do the specific services on the project. But the design firm should not be required to obtain all the permits and governmental approvals necessary for a project. That should either be the contractor or the project owner. And what I’m finding in some owner generated contracts is language that would suggest that the design firm has all that obligation, be really careful of that. Strike that out. Clarify that as a design firm, you’re only getting those licenses and approvals necessary for you that are typically necessary for you. And that to the extent that there are other licenses involved, you’re not going to obtain then. But rather, you will assist the owner who will obtain them. So, I have a clause here on the next slide that I have some language like that. It says Permits: quote “Design professional shall assist the owner in connection with the owner’s responsibility for applying for permits, licenses, and approvals needed for the project, and a connection with filing documents required for approval of governmental authorities having jurisdiction over the project.” Period, close quote. Notice that that clause does not say the design professionals’ going to go out and apply for them or obtain them. It says the design professional will assist the owner in doing so. Thank you for joining me today. I hope you’ve enjoyed this session that we did on risk management, and if you would like to contact me, I am putting a slide up here at the end that has my name, phone number, email address, and website information. Don’t hesitate to call me or contact me. And particularly, if you would like continuing education credits, we’ll explain how that can be accomplished. Thanks. Look forward to seeing you again.